Spring Cleaning Isn’t Just for Your Home! Spring has officially arrived, and one thing this season is notorious for is cleaning. Most of us have felt the call to get our worlds a little tidier once the flowers begin to blossom. But spring cleaning isn’t just for your home or office, it’s for your teeth, too. Spring cleaning is about refreshing your life and getting ready for all that spring and summer have to offer. Part of your refreshing routine should be a dental cleaning. If you’ve been lax about your routine dental cleanings, spring is a great time to start fresh for the new season. Gum disease is a serious condition that may go unnoticed if you don’t visit a dentist for a regular cleaning. If gum disease is left untreated, it can cause more serious problems down the road and may lead to tooth loss. The good news is, gum disease is treatable and can often be remedied with a simple cleaning in the early stages. Everyone loves a bright, beautiful smile. The first step toward that healthy smile is to get in the habit of routine dental cleanings. Everyday life takes a toll on your teeth. Consuming coffee, wine and other foods and drinks can stain your teeth. A dental cleaning polishes your teeth and removes these stains, leaving you with a brighter and whiter smile. You’ll feel refreshed and ready for the season. If you haven’t had a cleaning in a while, you may notice a white buildup around your gums. This buildup is plaque and can lead to serious tooth problems, including tooth decay and cavities. Cavities create holes in your teeth, making them more sensitive to food and drinks. If left untreated, cavities can cause serious problems. If you suffer from bad breath, it might not be the garlic pasta you had for dinner last night. Chronic bad breath can be a sign of more serious dental problems, and you should discuss it with a dental professional at your next cleaning. Use spring cleaning season as a spring board for your dental health. 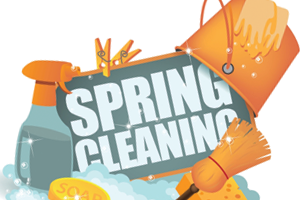 CALL OUR OFFICE TODAY AND ASK ABOUT SPECIAL “SPRING CLEANING” OFFERS FOR YOU AND YOUR FAMILY!